Today is Sunday, December 16th, 2007 and this is show #126. Wait a minute…didn’t I clearly say LAST week was show number 126? Evidently I was over excited last week and I jumped ahead a week! last week was 125, this week is 126. And get this, Quality Control Director Steve didn’t even NOTICE! What QA Director Steve DID notice was actually from 2 weeks ago was REALLY picky. Remember I was talking about my brand spanking new Vista laptop? In that description, I said it was a 2GHz Intel Core 2 duo, with 4GB of RAM, 800Mhz front side bus, and 2 MHz of L2 cache. two megaHERTZ? QA Director Steve was appalled that I did not say 2 MB of L2 cache. wow. he’s really having to be picky now, isn’t he? He also noticed something that’s really embarassing. In the same show, he says that I said “taking a different tact” when the correct phrase is “taking a different tack”. It comes from the sailing term for making a turn in a sailboat, and I should KNOW this because I grew up sailing! I’m appalled that I would make such an error, and I’m just glad my father wasn’t alive to hear me say something like that! I think we’re all glad that QA director Steve is here to keep me on an even keel. Ok, it’s time we talk about the audio problem from last week. Here’s what happened. I recorded my conversation with Steve Harris using WireTap Studio. 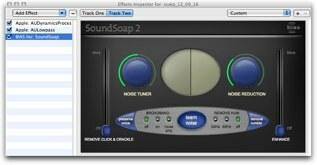 I noticed some hiss whenever I was talking, so I used the Bias SoundSoap plugin to reduce it, but only on my voice. For some reason, when the audio from that recording was converted from stereo to mono – it HORKED my voice big time, made it nearly inaudible and what WAS audible was so horribly distorted it was unlistenable. Great. And the bad news is that I didn’t find out until Monday night. That was bad. I spent all night diagnosing the problem, with the help of the guys from WireTap Studio – they didn’t actually find the problem but they worked on it a bunch and gave me moral support! After I figured out what was happening, I took the SoundSoap filter off, exported the file as an AIFF, ran the Levelator on it to get my levels back normal, pulled it into GarageBand, moved things around to make it fit because I’d done a ton of editing on the first one and there was no way i was doing THAT again. Exported that out as an AIFF, Levelatored all over it again, pulled it into iTunes, converted it to an mp3, added the ID3 tags, uploaded it to Libsyn where all my audio files are served, edited the feed in Feeder to reflect the new song length, and went peacefully to sleep. The bad news is that it was still wrecked! I can’t explain why exactly, but it appears that Libsyn must cache it in some way, because even though the new file was the one out on the web (which I verified by pulling it BACK from Libsyn), the old one was what would play if you clicked on the link! I discussed it with Bart, and he suggested that I change the name of the file and adjust that in the Feed, and maybe it would trigger Libsyn (and iTunes) to let you have the right file. I did that on Saturday, and finally the right file is coming through! I sure wish someone had told me mid-week that it was still busted – let me know when things are wonky next time, wouldja? You must have thought I was an idiot posting that the audio was fixed, and then leaving that garbage up there! Oh well, what do they say, “live and learn”? Remember when you reviewed pipette all those weeks ago? I found something built into the OS that does the same thing and more. It is called digital color meter and it is in your utilities folder. Not only can it show you the hex code, but the RGB numbers and other weird computer speak things (check it out yourself and tell me what things like Y’pbPr mean). Check it out. I did check it out and it looks like it does give some of the same info. For those that don’t remember, Pipette is the freeware one trick pony that lets you touch a color and it tells you the code for it so you can plop it into Photoshop or other programs like that. DigitalColor Meter is in your Utilities folder, and when you pop it open, you get a little window on the left that updates real time with a blowup of your cursor location, and on the right you can see the percentages of red, green and blue. You can shrink the aperture down until you’re practically looking at individual pixels so you can get EXACTLY what color you wanted. DigitalColor Meter does more than RGB as a percentage – as Connor points out, you can also view the colors by things I’ve never heard of, like the Y’pbPr thingy Connor mentioned! there’s also CIE and Tristimulus which is just fun to say. I had trouble figure out how to actually grab the color numbers though, if I clicked on the color I wanted, I’d get navigated away from DigitalColor Meter to the application I had clicked on. I actually had to open the help file and READ how to do it! turns out when you hover over the color you want, you hit command-shift-c to copy the color numbers and then you can paste them into your app. DigitalColor Meter is a little harder to use than Pipette, but it IS just sitting right there in your Utilities folder, might as well give it a try if you have a need for this kind of application! thanks Connor for the good news on iTunes and for the color picking tip. beautiful screen, reasonably nice keyboard but makes some swishing noises, rediculous port location (all on the left in the middle so if you’re left handed you’re dead, if you’re right handed, a cabled mouse won’t reach!) and of course I mentioned before that the ethernet card won’t work under XP! and Vista is slow. the system runs a bit slower than my 2 year old Intel Core Duo Mac. I was whining about this to my friend Keith and he said, “how much RAM does it have?” I promptly said, “4 gigs!” We both just kinda sat there trying to figure out why, when I suddenly thought, “well, I ORDERED it with 4 gigs, I wonder what they shipped it with?” I checked the system properties, and guess what? HP messed up – they only shipped it with ONE! so here I am running about 8 programs simultaneously on top of VISTA and I’m shocked that it’s slow! The good news is that HP overnighted memory to me, and we popped it in and things are MUCH snappier now – with Excel cached (that is, already opened once in that session before) it opens before I can say “one”. In reality the laptop can’t actually address 4GB, only 3.12GB (see MS technote: support.microsoft.com. I’d love to make fun of Microsoft for this but evidently it’s a chipset limitation or something? Macs can only address 3GB too. I searched around to find out if you have Leopard which is 64 bit would it make a difference, but i got bored searching and gave up. Keith and I, in our poking around, found out something else interesting, this machine is NOT a 2GHz core 2 duo like I thought – it’s a 1.6! When I ordered it through my company, they asked for the 2GHz but were told that it was a “configure to order” option and wasn’t available right now. Um, gee, the lowest end Mac laptop you can buy today is a 2GHz core 2 duo! Oh well, stupid, but what are you going to do? And one more whine about this machine – the keys are shifted off center to the left! so the track pad isn’t in the center between your hands – so EVERY time I set my fingers on the keyboard they’re in the wrong position. Took me a while to figure out why this kept happening! One of the main reasons I got a windows machine was because I want to do an Excel podcast for work, and since it’s a windows centric world, I need to demonstrate in the windows version of Excel. My adventure now is trying to figure out how to use Camtasia Studio from TechSmith. this is a highly capable screen capture tool for Windows. So far I’m stumbling around a fair amount, not finding it to be the most intuitive thing I have ever tried. Here’s an example. You can create a title slide, and add a sound track along with it. I wanted a title slide, a music track, and me speaking over the music, but I wasn’t able to do that. I ended up after a half day messing with it, launching Audacity from audacity.sourceforge.net. I was able to drag in the music and then do the voiceover to the music, and then export as a wav file and pull into Camtasia. Well, I should explain that the audio I found in the sample music was a wma file, which i couldn’t import to Audacity. Well it turns out that Camtasia could read it in, and could write it out as an mp3! So I pulled the wma into Camtasia so i could export it as an mp3 so that i could import it into audacity so that I could add a voiceover track so that I could export it as a wma that I could then import back into Camtasia! Whew, that was nuts! but it worked. The other thing I can’t figure out is why the fade-in/fade-out buttons are greyed out when i try to apply them to the sound track. Not sure what use they are if they won’t work on my music track! Did a lot of searching online, watched a bunch of videos at techsmith, even downloaded the 355 page pdf file (which is REALLY slow to search on a Vista machine with 8 applications running with 512MB of RAM! This is fun learning, and I took the laptop home (with 4GB in it) to play over the holidays, should be able to find some time in three weeks off to actually get some stuff recorded! Stay tuned for my continuing adventure in Windows Vista! Nothing new and fascinating happened on the Honda Bob front, so I headed over to his great website to see if he’d posted any new “interesting travel stories” as he calls them. this is where he’s been recording the crazy things he’s run into in his travels and adventures in the auto world. My attention was taken to a story about how he was at a car show and met a guy with an experimental electric car who was looking for a place to plug it in. Bob popped the hood on his Honda Element and showed him that he could plug into the inverter Bob had installed under his hood! Get this – Bob was able to charge this guy’s engine for 4 hours – without his own engine running at all! He also has a solar cell on the dash that helps keep his battery charged. While Bob enjoyed getting to really use the inverter he’d installed and how cool it was to be able to do that, what really made him happy was helping out a total stranger. He was rewarded by finding out that the guy actually had two Hondas at home, so you know Bob won over a customer that day. Check out this and many other funs stories at hdabob.com. Better yet, if you’ve got a Honda or Acura car and you live in the LA or OC area, give him a call at (562)531-2321 or shoot him an email at hdabob@aol.com. HDA Bob’s Mobile Service is not affiliated with Honda, Acura or Honda Worldwide. Check out the photo of raindrops on my car. It’s better than a photo of me waxing it. I worked hard on it and it’s nice and smooth but because the car is silver in color it’s hard to notice the shine. I’m ready for the next lesson. 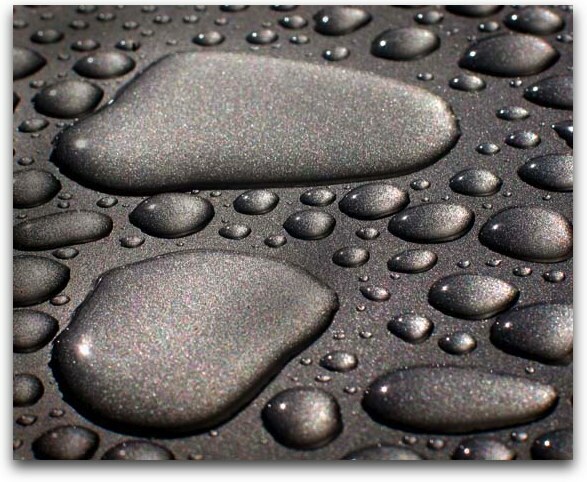 You have to go over to the blog and see this photo – it’s probably the coolest water droplet photo I’ve ever seen – he obviously did a great job at waxing and claying! Have YOU waxed your car yet? got some time off over the holidays I bet – a good time to get started don’t you think? Remember, you don’t have to wash and clay and wax and tire black and vacuum and clean the inside of the windows all on one day! Pace yourself – set a goal of washing the car, and then claying and waxing JUST the hood this weekend. Once you do that, you’ll be so happy about it (and NOT exhausted) you’ll be itching to do the roof next week and the trunk after that and pretty soon you’ll be sucked into my madness! This week I was reading the Wall Street Journal all cozy up in bed to stay warm, and I read this fascinating article about this guy in this African country called Malawi who when he was around 16 years old figured out how to build a windmill from looking at an old donated text book. Maybe this doesn’t sound like much, but this kid’s family was so poor they couldn’t afford the $80 to send him to the local school. His windmill changed their lives – they thought he was crazy at first and then he strung 6 light bulbs around the house. Suddenly they had LIGHT. now they have a radio and a TV powered by his windmills. The story went on to explain about how people from miles around drive to his house to see his windmills and how he became well known enough that some venture capitalists picked up on what he was doing and now they’ve funded him to go to this prestigious school to pursue his dream of harnessing wind energy for his country. There’s now a website all about him, and the Wall Street Journal has put up a video of the interviews with him and you can even see his crazy windmills in action. They’re really rickety so they flex a LOT as the blades spin around! I find the most interesting articles in the Wall Street Journal, things I’d never find elsewhere. If you’d like to get the Wall Street Journal too, click the link in the sidebar on podfeet.com and help support the show too! I’ve just found a GREAT source for cables that’s really inexpensive, ships VERY quickly and a videophile buddy of mine swears by their quality. I bought a Camcorder DV cable ($50 at radioshack) for $3.00, 0.23 tax, and $2.00 shipping, so out the door for around $5. Arrived in TWO DAYS! I needed a 6′ USB device cable for a printer, and it was 95 CENTS! $1.93 for shipping in two days – out the door for $2.88. Isn’t this insane? Enough teasing, the site is monoprice.com. check them out next time you need a cable! How should my father-in-law best synchronize a file between two Macs? I think that’s about enough for today, I’m so proud of you for doing your homework assignments – waxing your cars, writing iTunes reviews, sending me emails, you guys rock! Keep up those emails by sending them to allison@podfeet.com or if you get the courage up to make an audio recording, send it to nosillacast@gmail.com. Thanks for listening, and stay subscribed. Wow! Did HP take care of them? Bad things happen, but four in a row? Did they buy a Mac after that? I think you are close on the thing about Macs and how much RAM they can address. Its not leopard that is key, but the chipset of the laptop. The santa rosa based core 2 duo macbooks I believe were the first mac portables that could support more than 3GB of RAM, but the mac pro towers were always able to handle more. (remember Tiger was partially a 64 bit operating system – just not for GUI apps). My family just returned them all and we got another windows computer, because my Dad loves to play Call of Duty United Offensive Deathmatch after work. My family has a Mac where my mom checks her E-mails, but she does not see any reason to upgrade to leopard. We also have a Mac OS 9 but it freezes to much, so I am utilizing the power cord for a computer that I am trying to put Linux on.